Roger Broer, a member of the Oglala Sioux Tribe, was born in Omaha, Nebraska in 1945 to mixed Native American and white parents. He was adopted and raised by Ludwig and Frieda Broer, a traditional German family from Randolph, NE. He received his BA, Extended Fine Arts from Eastern Montana College and his MA from Central Washington University. 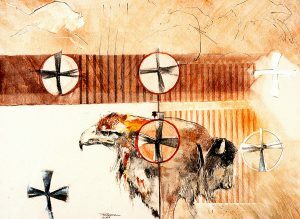 There is a certain mystical quality to his American Indian art through the way he attaches humanness to his animals. Broer specializes in monoprints, but also is interested in painting, drawing, and sculpture. His unique style combines realism, impressionism, surrealism, and automatism.